With photography by Melissa Jill Photography and design + styling by Victoria Canada Weddings and Events, today's colorful styled shoot was inspired by the icon glass at the entrance of the Arizona Biltmore Resort. Frank Lloyd Wright was the consulting architect for the building of this historic resort in 1928, which was known as the "Jewel of the Desert." And so with this in mind, the designer decided to incorporate vibrant jewel tone colors in homage to the stained glass, and to reflect the geometric pattern of the famous Biltmore Block that makes up so much of the resort's exterior. 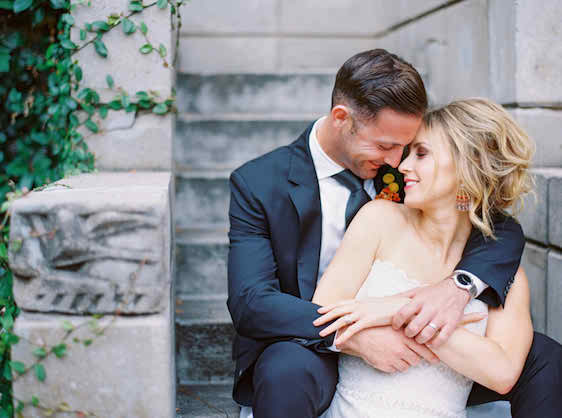 Some of the standout elements to this shoot include: A color blocked bouquet, a cake with stained glass elements to reflect a clean, modern and colorful feel, and a floating "glass" ceremony backdrop. This design aesthetic reflects the clean geometrics that Frank Lloyd Wright was known for. And these colors? So absolutely fun, if you ask me! The bride's gown is Love Marley by Watters, a statuesque lace-paneled dress that marries modern and vintage. And my color-loving heart just exploded, you guys! The modern styling, the wooden invitations, all of these southwestern, desert inspired details? Color me inspired! I just love what this talented group of wedding pros dreamt up. And these blooms by floral designer, Angelic Grove? It's official! I'm in love. No Comment to " A Colorful Stained Glass Inspired Soirée "